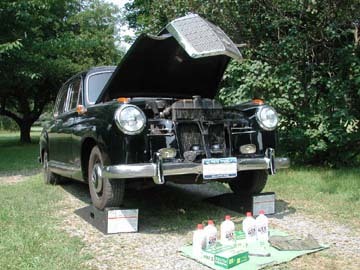 This page chronicles an oil change on a 1957 Mercedes-Benz Type W121 190 Ponton sedan with a 121.923 gasoline engine. Dear readers, the 121.923 engines (1,897cc) were original to the Type W120 180a and 180b Ponton sedans, i.e. this car had an engine transplant at some point in its history. Regarding diesel engines OM 636 (Type W120 180D, 180Db sedans) and OM 621 (Type W120 180Dc, W121 190D, W121 190Db sedans) – the location and orientation (horizontal or vertical) of the oil filter housing may differ from what is shown here. Check the owner's manual or workshop service manual to verify the location of the oil filter housing on these models. Otherwise, the general process is applicable to all Ponton models. Many readers may already know how to change the oil in their Mercedes-Benz Ponton. It is typically one of the first maintenance jobs we learn on a car because it does not require much time, money, specialized knowledge, or tools, and it helps familiarize us with the vehicle. This webpage illustrates the basic steps in performing an important job. If you have not yet tried changing the oil, this page is for you. Over an extended period, routine oil changes are one of the best ways to prevent engine problems. The interval between oil changes can vary depending on driving habits. Suggested intervals are 3,000 to 5,000 miles (approximately 4,000 km to 8,000 km) for a car that is driven regularly, all year long. If the car is driven infrequently, and sits in a garage most of the time, it is best to change the oil every year, regardless of the miles driven. 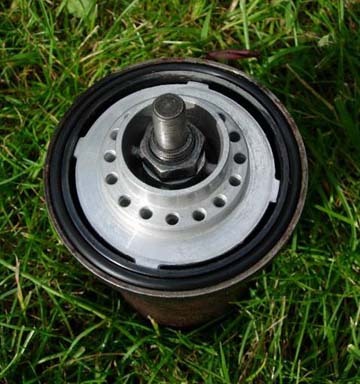 The oil filter is a replaceable paper element that fits in a permanent metal canister, which bolts to the lower portion of the engine. 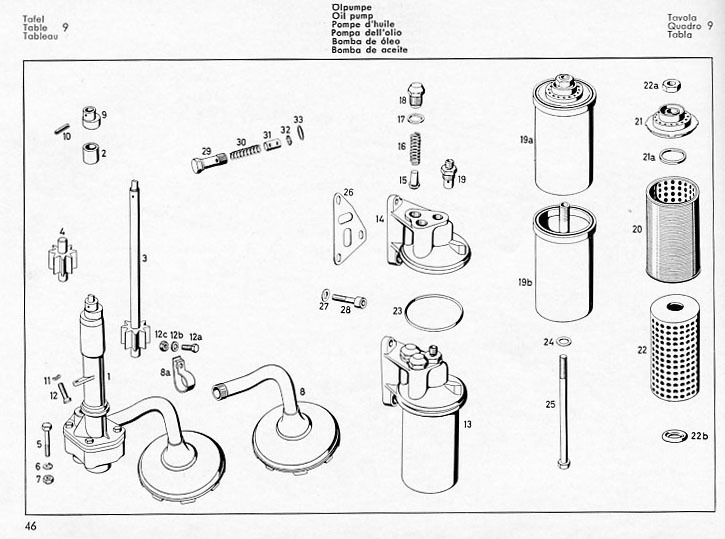 There are two different oil filter designs used on the Ponton models. The first is a paper filter element with a wire screen element. The wire screen element requires cleaning every time the oil and filter are changed. This article features the later style paper filter element (no wire screen). If your car is equipped with the early style oil filter with the wire screen element, be sure to clarify this with your parts vendor because a smaller paper filter element is required with the wire screen element. Since the Mercedes-Benz Ponton vehicles are quite old and perhaps a little rusty underneath, you will need to have a set of ramps or a floor jack to elevate the front of the car while working under it. The original jack that came with the car is probably of little use because the jack points on the body may be structurally weakened by a less than perfect chassis. If a floor jack is used, then you will also need a set of jack stands to place under the car in the event the jack fails. People living in earthquake zones may want to bolster the car with two tires (mounted on the rims) stacked under several points to increase the safety factor. Floor jack or ramps. If you have a lift or pit in your garage, you probably do not need to read this page. 14 mm hex (Allen) wrench for oil drain plug. Bring the engine up to normal operating temperature so any impurities will be in suspension when the old oil is drained off. Drive the car up on ramps to gain easy access to the oil drain plug and oil filter canister. Place the car in first gear and place a block of wood behind a rear wheel to ensure the car will not roll off the ramps while you are under it. A floor jack can also be used. In this case, jack the left front of the car up so the side of the engine where the oil filter is located (the same side for both left hand drive, and right hand drive cars) will be easier to get under. Be absolutely sure you place a jack stand under the car so if the floor jack fails you will be safe. Never work under a car that is only supported by a floor jack. 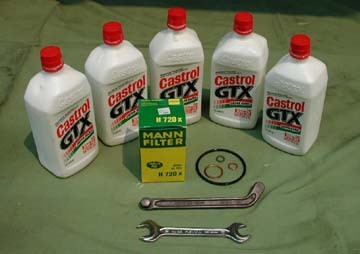 This photo shows the motor oil (Castrol 20W-50), new oil filter with rubber O-ring and seals (supplied with the oil filter), 14 mm hex (Allen) wrench (for oil drain plug) and a 17 mm wrench (for oil the filter canister). A 17 mm socket wrench may also be used on the filter canister. 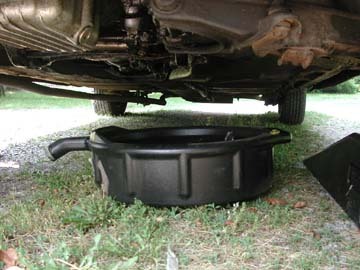 Place a drain pan under the car to catch the old oil. When finished, take the container to a service/recycling center so the oil is disposed of in an environmentally safe way. Do not dump the used motor oil on the ground, into a sewer drain, or down a woodchuck hole. 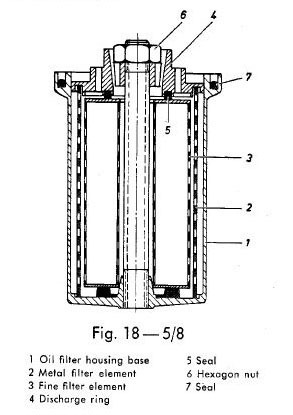 Figure 4 shows the paper oil filter element, which slides into a metal canister (see Figure 9). The metal canister is a permanent fixture on the car, and is re-used each time the filter is replaced. This photo shows two different style 14 mm hex (Allen) wrenches. 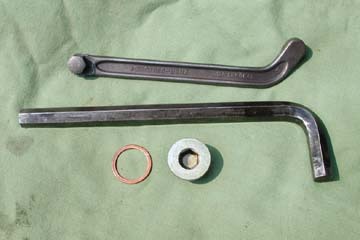 The smaller one (top) is from an original Mercedes-Benz Ponton tool kit, and the larger "L" shaped one is from a general purpose automotive supply store. The larger, "L" shaped hex wrench will work well on the oil pan drain plug because there is unlimited clearance for the tool beneath the car. However, because of tighter clearance between parts, the original 14 mm hex wrench will be needed if the transmission fluid is changed. Also note the 22 mm copper crush ring, and oil pan drain plug. The ring is usually supplied with the oil filter, and should be replaced each time the oil and filter are changed. Verify with the vendor that the crush ring is included with the oil filter, or ask them to include one. They can be purchased from various internet sources. Remove the oil filler cap to achieve maximum flow into the drain pan when the plug is removed. Position yourself under the front of the car, and place the drain pan under the plug. 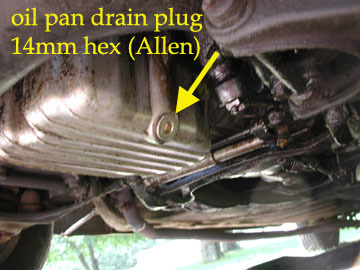 Use the 14 mm hex (Allen) wrench to remove the drain plug. The drain plug is loosened by turning it counter-clockwise. If you have difficulty removing the plug, it may be over tightened. In that case, try fashioning a breaker bar (to increase leverage) by putting a section of pipe over the end of the wrench. Once the plug is removed, let the oil drain for five minutes or until the flow is reduced to just a trickle. Then replace the drain plug along with the new copper crush ring (22 mm). New drain plugs are available from the usual sources. See the Links page for detail. Get the roll of paper shop towels ready! 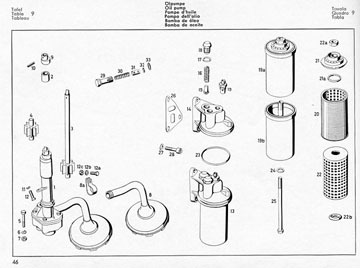 To gain access to the oil filter canister, position yourself under the front of the car and slide far enough back – until you see the canister, or slide under the left side of the car and move far enough to the center so you can get the 17 mm wrench on the bolt at the bottom of the canister. 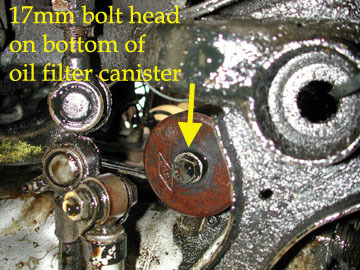 Then position the drain pan under the oil filter canister and proceed to loosen the 17 mm bolt. When it starts coming loose, the remaining oil will start to flow (all over). When the canister comes completely loose, just let it rest on the steering and suspension components until it is finished dripping. Then remove it from the top side of the engine compartment. If you want to remove the canister from the bottom, you need to tip it, which spills more oil. When lying on the ground holding the canister, the oil only goes in one direction – up your arm. Removing the canister through the top of the engine compartment is much neater, you'll agree. Figure 9. 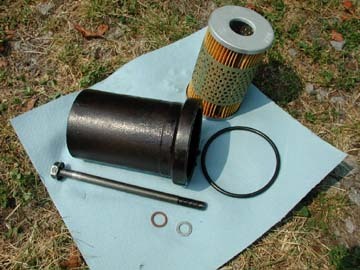 Metal oil filter canister, bolt, aluminum seal, copper washer, and filter (later style). This is second version of the permanent metal oil filter canister (reference Table 9 Part #19b below) along with the (17 mm head) bolt, the rubber O-ring, and paper filter element. Replace the aluminum seal for the bolt, and the O-ring seal at the top of the canister. 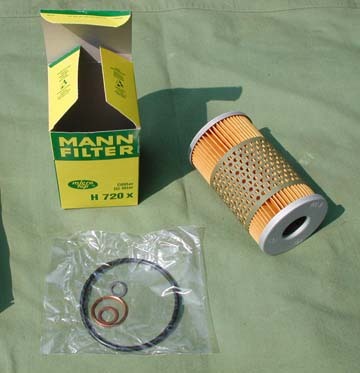 Most filters (Mann, Hengst, etc.) include a set of new seals and rubber O-ring. Also note the paper towel in this photo. You will need plenty of these on hand before starting the job. Insert the new paper filter element into the canister, and install it on the car. Crawling under the car from the front affords the greatest physical and visual access to where the canister and bolt are installed. The bolt seems barely long enough, and holding the canister in place while threading the bolt can be a challenging maneuver. WARNING: REMOVE THE OLD O-RING! Make absolutely sure the old O-ring "seal" (Fig. 18-5/8 – #7) is removed before installing a new one. They are deceptively easy to overlook, and while a second O-ring will probably fit into the groove without much trouble, it will defeat the seal, and bring about rapid oil loss once the engine is started. Use a miniature, flat blade screw driver to probe the groove of the canister where the O-ring sits, and pry the old one out. Check again for leaks before driving. 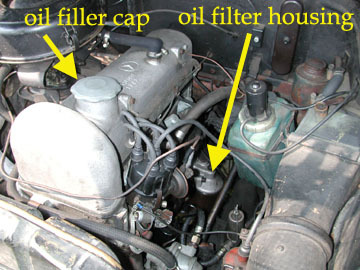 This photo details the top section ("discharge cap") of the early permanent metal oil filter canister (Table 9 Part #19a) from a 1958 Type W180 220S sedan. These individual parts are typically supplied with the filter elements (Hengst and/or Mann brands) as a complete kit. See the Links page for vendors of the filter elements. Part 39: copper crush ring. Part 40: oil pan drain plug. Part 23: rubber O-ring. Part 24: aluminum seal for oil filter canister. 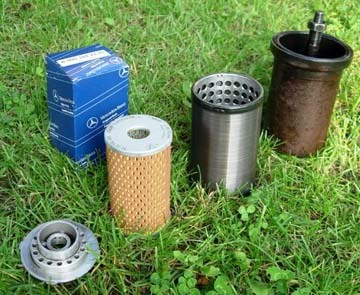 Typically (not always) the OEM oil filter supplied by Mercedes-Benz is the Mann H720x. For M-B filter (000 180 00 09), the following oil filters were identified as direct crosses. There may be other quality filters. Some, like the Mann, Hengst, and Knecht include the copper crush ring (22 mm) for the oil pan drain plug. Some, like the WIX do not, but they can be purchased from various internet sources. Ask your vendor if the crush ring comes with the filter. All of these filters are believed to come with the large rubber O-ring for the top of the canister, which itself is M-B (000 184 31 08). Note: Fram makes a filter that fits, but has less than half the pleat count (surface area) as compared to the filters shown here, which results in far less usable filtering surface. Both Fram and Purolator filters are not recommended. 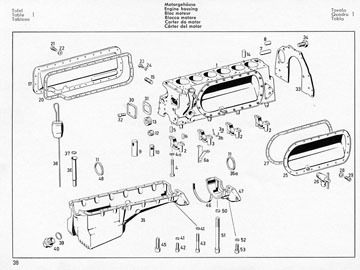 A Illustrated parts catalog: Original-Teilekatalog Baumuster PONTON 219, 220a, 220S, 220SE Coupé, Cabriolet (Bestellnummer: L6510000008). 2001/2002 Edition. Soft cover, 172 bound pages, written in German. B Table 9, Part 24. 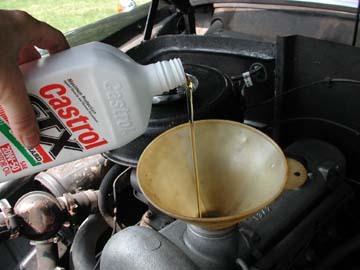 After replacing the oil filter and drain plug, refill the engine with new oil. Verify the exact amount by checking the owner's manual. I use 20W-50 multi-grade oil for the Ponton because it is heavier than the standard 10W-40 multi-grade, and may minimize leakage around the old seals. Replace the oil filler cap. Remove the block of wood from behind the rear wheel – and any supports placed under the car. Start the engine, and drive back down off the ramps. With the engine running, check under the car for leaks. Stop the engine, and check the oil level on the dipstick to make sure the crankcase is filled to the correct level. Before putting everything away, record the date, odometer reading, and the amount and weight of oil used. Also indicate whether the filter was changed. Check the oil level frequently. It is a good habit to check it at each fuel stop. Reference: Service Manual Models 180 to 220SE / S-1201-000 / Job 18-5 / pp. 18-5/3, 18-5/4, 18-5/5. The wire screen should be soaked in trichloroethylene for a period of time and scrubbed with a soft brush thereafter. Gasoline will not satisfactorily clean the element. Trichloroethylene is used mainly as a solvent to remove grease from metal parts and is sold by the gallon at most automotive supply stores as "carburetor cleaner" or "parts solvent." The container will sometimes include a strainer for the parts to soak in. The 1957 Type 190 sedan used for this article does not have its original engine. It has a 121.923 engine from a Type 180a or 180b sedan. A 1957 190 sedan originally had a 121.920 engine, which used the oil filter with the wire screen element. This brings up an important point; When ordering parts for your Mercedes-Benz Ponton, be sure to tell the parts vendor the engine and/or chassis number of the vehicle. Identifying the car by only the year and model can lead to confusion – especially if the engine has been replaced. For more information, visit the Chassis and Engine Number page. Figure 13 shows an original, 14 mm hex (Allen) wrench 120 581 06 65 – as issued with all Mercedes-Benz Ponton sedans, coupés and cabriolets when new. The contemporary Mercedes-Benz (Daimler AG) part number for the oil filter combination wrench is 000 589 24 07 00. As of June 2014, the tool was still available through the Mercedes-Benz Classic Center in California. See the Tool Kit page for details, alternative tool brands and part numbers (search for Stahlwille 3677 and Hazet 2760). Multi-grade oils can be thought of as two oils in one. Instead of 30W (weight), which was the normal oil used when the Pontons were built, most people now use a multi-grade oil like 10W-40. This oil acts like 10 weight at low temperatures and 40 weight at high temperatures. Why use a multi-grade oil? To get the best of both worlds. The 40 weight oil flows very well and provides superior protection at high temperatures, but is too thick at low temperatures, such as when the car has been sitting for a while. The 40 weight would make the engine harder to start, and would significantly delay the time when the various engine parts received lubrication when first starting the car. The 10 weight allows easy starting and fast lubrication, but would not provide enough protection at high temperatures. So 10W-40 refers to an oil that provides the easy starting and fast lubrication, plus the good protection at high temperatures. Other grades of multi-grade oil commonly found are 15W-50, 20W-50, and 5W-30. Use the lower numbered grades in winter and if you car is not leaking oil. Higher viscosity can minimize leaking in some cases, and is more suitable for summer use.